Susan VandePol Life After Breath is a faithful friend and companion to a widow’s grief that will enable her to look into grief and heal when others want to look away. It gives resolve without insisting on an answer and prepares a widow to champion her own Biblical cause in a way that no other book or resource on the market offers. There are countless millions of widows crippled without a voice; Life After Breath breathes life back into a grieving woman and prepares her apart for a set-apart calling. “During those last few months, the pressure was something of another world and as earthly life wept, the bleeding of our hearts began to mingle with eternity and hovered in a strange vapor. There was no song to be heard; just the rhythm of waiting; and life held its breath.” “The truth of what is ahead for you must be found in God’s Word. You will see there that you are meant to be one of His greatest allies in these times of faint hearts and tribulation. As a widow, you have been called for a great and unique purpose.” The word “widow” carries with it the meaning of being severed; torn apart from what she was once one with. In Hebrew, it means “an empty house.” To be a widow also means to be prepared “apart” but God’s tender heart never meant for her to be isolated and crippled. Widows are prepared apart for a “set-apart” calling. 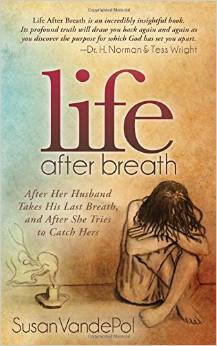 Life After Breath is a warm and honest companion and friend in the midst of a widow’s darkness and seclusion, and sets in place the foundation for her future with insight into a sacred Biblical revelation that will take your breath away. Susan Vandepol founded Families of the Fallen after the duty-related death of her husband in 2005. Its accompanying protocol supplies a model to firefighters and first responders to use when coming alongside a widow of a fallen firefighter, as well as providing firefighters with a pragmatic way to express their own grief in a way that won’t compromise all that is inherently masculine about their profession. It is now being used in departments around the country and is endorsed by experts in the fields of grief, crisis, trauma, suicide prevention, CIR, PTSD, and CISM.